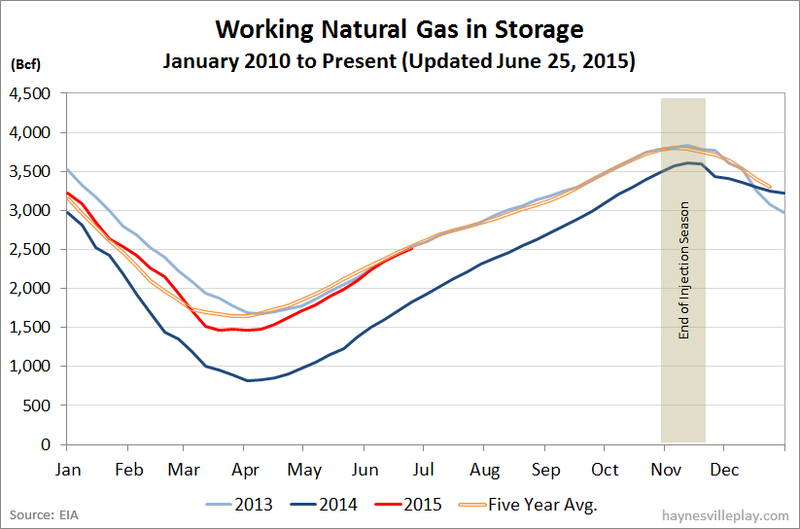 The EIA announced this morning that working gas in storage was up 75 Bcf last week to 2.508 Tcf. The injection was 13% lower than last year (+86 Bcf) and 32% below the five year average (+110 Bcf). The current storage level is now 38.3% higher than last year (1.813 Tcf, a difference of 695 Bcf) and 1.4% above the five year average (2.473 Tcf, a difference of 35 Bcf. A quick note for a Friday afternoon. I have been reading lots of comments and headlines about bankruptcies, both actual and potential, in the oil and gas industry, particularly among companies focused on shale. There is no doubt that there will a huge fallout from low oil and gas prices, but some doomsayers are suggesting that the whole "shale industry" will collapse. To me, that's a terribly naive thought. Yes, many companies will go under and thousands will lose their jobs, but the oil and gas resources aren't going anywhere and the technology is only improving. Picking up from the ashes is what we as Americans do very well (something I think the Saudis don't fully appreciate). The players may change and the output may slow for a while, but the shale oil and gas industry be here for a long time. 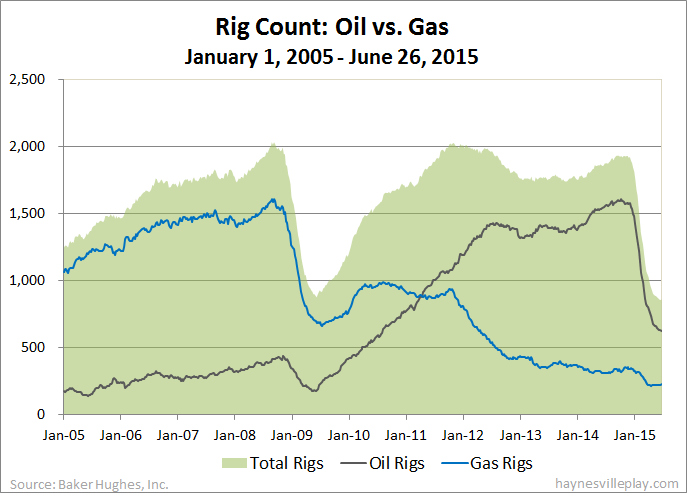 The Baker Hughes U.S. rig count is down only two this week to 857, the smallest decline in the past 28 weeks. Oil rigs were down four to 631, gas rigs were up two to 223 and miscellaneous rigs were unchanged at three. By type, horizontal rigs were down one to 662, vertical rigs were down one to 100 and directional rigs were unchanged at 95. 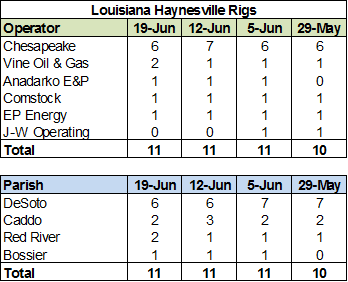 Among gas rigs, horizontal rigs were up two to 165, directional and vertical rigs were unchanged at 44 and 14, respectively. 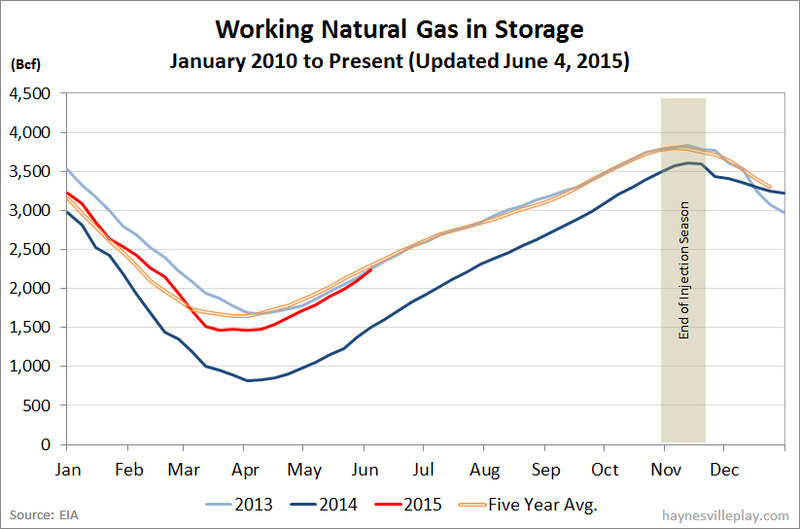 The EIA announced that working gas in storage was up 89 Bcf to 2.433 Tcf. The weekly injection broke a recent string of triple digit injections and was 21% lower than last year (+112 Bcf) and was largely in line with the five year average (+87 Bcf). This is the approximate point in time last year when the enormous deficit in storage started to erode. The current storage level is now 42.9% above last year (1.703 Tcf, a difference of 730 Bcf) and 1.9% above the five year average (2.387 Tcf, a difference of 46 Bcf). After selling only 16,000 CNG fueled Civics in the U.S. since 1998, Honda finally pulled the plug on the CNG Civic. The company will also abandon a gasoline-electric hybrid Civic and plug-in hybrid Accord in favor of a hydrogen-fuel-cell car for 2016 and a full electric vehicle for 2018. With low oil prices potentially on the horizon for a while, the writing was on the wall. The Civic was one of the few hopes for widespread CNG adoption for passenger vehicles, but it proved to be a Quixotic venture. Ultimately, the success of mass market CNG is dependent on adoption by fleet vehicles and commercial trucks and the infrastructure that will follow (larger interstate trucks will likely prefer LNG, which is inappropriate for passenger vehicles). Although, even if almost every delivery truck on the road is fueled by CNG, it doesn't mean the corner Chevron station will have it. In my opinion, CNG will always be a niche fuel in the passenger market, as electric hybrids and other technologies offer more fueling flexibility. The Haynesville Shale rig count was up one last week to 21. Louisiana held at 11 (Chesapeake was up one, J-W was down one) and Texas was up one to 10 (Sabine has a new rig). The Sabine rig is interesting: we've discussed the company's financial issues as recently as yesterday, but it seemed to have lost interest in drilling the Haynesville. But we haven't seen an investor presentation from them since they combined with Forest Oil. They've been in a distressed situation since last summer, so they have had other fish to fry instead of going to analyst meetings, therefore it's hard to say what they are up to from an operational perspective. Sabine Oil and Gas announced this morning that it will not be making a $21 million interest payment due today on its 2019 senior notes. The company exercised its rights to a grace period that gives it another 30 days to make the payment before the loan goes into default. Sabine was already on the clock with most of its debt holders, as it had negotiated a forbearance agreement with is revolver and its second lien facility, but the clock is ticking even louder now. Sabine says it still has $276.9 million in cash and is able to fund its operations and pay its suppliers and trade creditors, but I'm sure trade terms are tightening and knuckles are getting whiter by the day. The EIA announced this morning that working gas in storage was up 111 Bcf to 2.344 Tcf. The weekly injection was in line with last year (+109 Bcf) but 25% above the five year average (+89 Bcf). The current storage level is now 47.2% above last year (1.591 Tcf, a difference of 753 Bcf) but 1.9% above the five year average (2.3 Tcf, a difference of 44 Bcf). 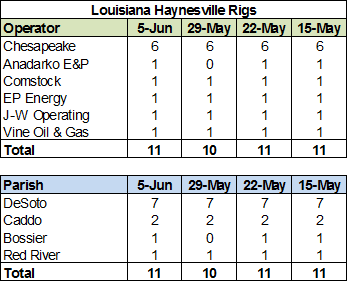 Last week's Haynesville Shale rig count was up one to 20. Louisiana was up one (Anadarko) to 11, while Texas held at nine. EPA Finds No "Widespread, Systemic Impacts on Drinking Water"
"We did not find evidence that these mechanisms have led to widespread, systemic impacts on drinking water resources in the United States." The report does say that there is the potential for spills and leaks. It also points out the vulnerabilities in the water life cycle in fracking, especially in disposal. But the major finding is that there isn't a systemic problem with drinking water. It's a big win for the oil and gas community. Will it change the debate much? Probably not. Samson Resources, which operates two subsidiaries in the Haynesville Shale, Samson Lone Star (TX, obviously) and Samson Contour (LA), looks like dead man walking, as it grapples with low energy prices and a high debt load. All of the producers have to deal with the low prices, but Samson is saddled with around $3.6 billion of debt from its $7.2 billion 2011 acquisition by private equity investor KKR in addition to its operating debt. The company has tripped debt defaults, although some provisions have been suspended temporarily by the bank, and has begun large scale layoffs. It also announced last week that it has ceased drilling for now to conserve cash. It had previously tried to sell off assets but didn't get much interest. The EIA reported that working gas in storage was up a whopping 132 Bcf this week to 2.233 Tcf. The injection is a record for this week and was 12% higher than last year (+118 Bcf) and 43% above the five year average (+92 Bcf). The current storage level is now 50.7% higher than last year (1.482 Tcf, a difference of 751 Bcf) and 1.0% higher than the five year average (2.211 Tcf, a difference of 22 Bcf).